I'm thankful that every Friday an author or educator finishes my sentences. I love the angle each participant takes. 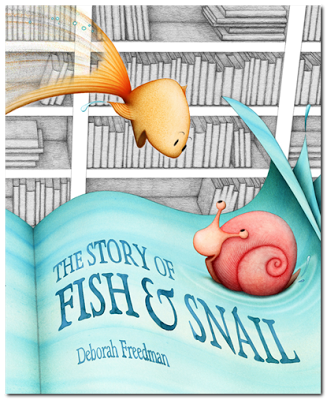 Today's guest, author-illustrator Deborah Freedman, will make you think, smile, and run to your public library or independent bookshop to check out her gorgeous and top-notch picture books. I wrote the words in red, and Deborah wrote the words in black. Thank you, Deborah! 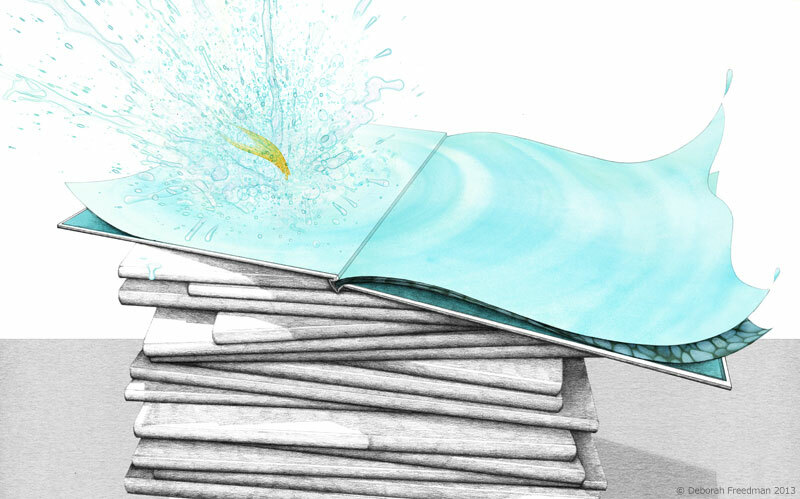 The Story of Fish and Snail is about the joy of sharing books with a friend. I hope The Story of Fish and Snail leaves children eager to jump into new books, or even to write their own — perhaps new adventures for Fish and Snail! Emma and Lucie are the names of the two sister characters who love to draw in my first book, SCRIBBLE. They are also my daughters. The “real” Emma and Lucie are much kinder than the fictional Emma and Lucie, but their story would have been boring (sorry, girls)! I found the idea for Blue Chicken between the lines of William Carlos Williams’s poem “Red Wheelbarrow." 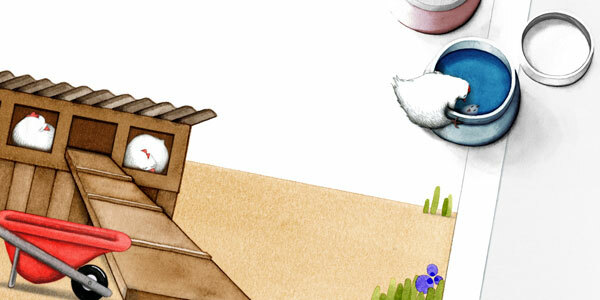 I wrote a story about those white chickens and then neglected it for a year, until one day I thought, “wouldn’t it be nice if this book just finished itself?” So that’s what happened — the littlest chicken did it. My studio is basically anywhere I am, since I always have pencil and paper on my person. The small, dormered space where my books’ final drawings and paintings happen is pretty piggy right now (I’ve made a huge mess working on the next book), but here’s the the cleaned up version. My “Idea to Book” presentation is constantly evolving, but always includes pictures, props, and officially classified stories about my childhood self. For the youngest children, I bring my chicken assistant, who loves to draw and to read books about herself. 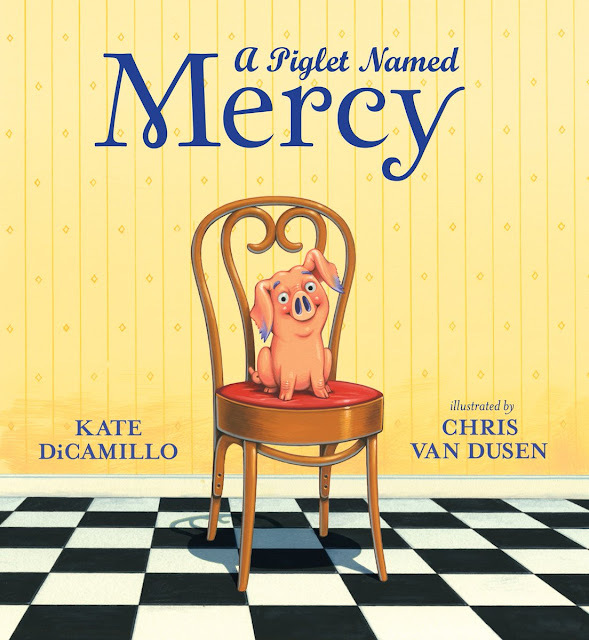 Picture books connect the written word to the world. Mr. Schu, you should have asked me how many books do you have on hold at the library? The answer: hard to say. Only my librarian knows for sure, since she sometimes adds her own suggestions to my stack. I wish for everyone a librarian like her! I am giving away a signed copy of The Story of Fish and Snail. 1. It will run from 6/7 to 11:59 P.M. on 6/9. 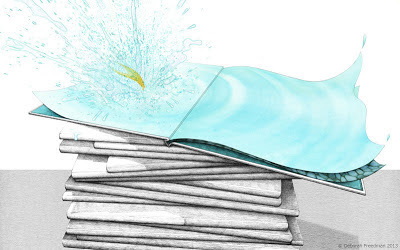 Borrow The Story of Fish and Snail from your school or public library. Whenever possible, please support independent bookshops. I definitely need to check this one out. I have an underwater theme in my reading classroom.